Observed with great enthusiasm by lovers, Valentine’s Day is celebrated on February 14 annually. Though the feeling and expression of love is not limited to any particular day; nevertheless, Valentine’s Day has special significance for lovers. As per legends, the day is celebrated in honour of Saint Valentine who recognized the importance of love and was imprisoned for performing weddings of lovers. It is a unanimous fact that presenting gifts is the perfect way to express one’s true feelings to someone. Do not wait further and convey your love to that special someone in your life by presenting charming Valentine’s Day gifts to him / her in Gurgaon. If your beloved is living in Gurgaon and you cannot spend this Valentine’s Day with him / her in person, then you can express your unconditional love by sending delightful Valentine’s Day gifts to Gurgaon, instead. 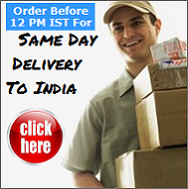 Buy/order cheap Valentine’s Day gifts for India delivery and surprise your sweetheart on this romantic day. Send Valentine’s Day presents online to Gurgaon and other nearby cities, like New Delhi, Faridabad, Ambala, Panipat, Jhajjar, Palwal, Rohtak and others, at cheap prices. Sending Valentines Day gifts to Gurgaon (India) is easy now! Buy/order and send Valentines Day gifts to Gurgaon online with awesomeji.com and get free delivery.